The University of Montana Herbarium (MONTU) is a facility that belongs to the people of Montana, U.S.A. Although it is housed at the University, it is used by people from many walks of life and from all across the state. As many of us know, smaller natural history museums are losing support from their parent institutions. A little over two decades ago our herbarium was beginning to see signs of waning interest by the University. Rather than wringing their hands, a small group of botanists and concerned citizens decided to be proactive and, under the auspices of the University of Montana Foundation, founded the Friends of the UM Herbarium (FOH). The group sent out letters to over 250 people and within a year the Friends had 75 members. A board of directors was elected, composed of two consultants, two biologists from the U.S. Forest Service, a concerned citizen and the MONTU collections manager. The UM Herbarium clientele now had a voice. Over the past 20 years FOH has supported MONTU’s collections through their biennial dues and volunteer work parties. Twenty-five people have served on the board of directors including state and federal biologists, consultants, ranchers, and interested lay people. Our first order of business was to relieve the overcrowded shelves of the specimen cabinets. The first cabinet drive, held from 1996 to 1999, raised $13,000 and allowed the purchase of 16 new cabinets. Over the next two decades the FOH Board developed new policies for specimen annotation and specimen use in molecular genetics studies as well as providing guidance on day-to-day activities such as what geographic areas should be the focus of the collections. 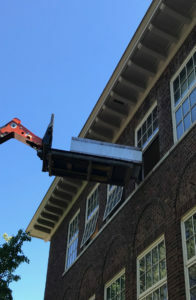 Twenty years after the first cabinet drive it again became apparent that cabinets were at capacity and more were needed. A second cabinet drive was initiated in 2017. 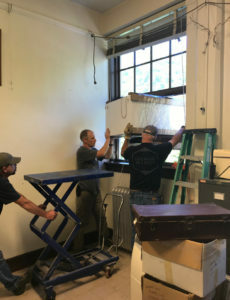 A year later FOH had raised $17,000 allowing the curator to purchase 11 new cabinets. 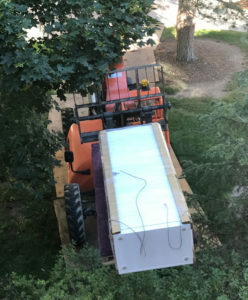 In the summer of 2018 these were delivered to the third floor herbarium through a window using a hydraulic lift (see figures on left). Staff are now busy rearranging specimens in the old cabinets and filling the new cabinets. We believe that the new cabinets will provide adequate space for specimen acquisition for the next 15–20 years. The Friends of the UM Herbarium has been indispensable in these days of shrinking budgets. Perhaps even more importantly, FOH has provided advice from a diverse array of practitioners, people who use MONTU for managing biological diversity on public and private lands. If the value of the herbarium is ever questioned by university administrators, FOH will be there to set them straight.